As Bader descended under his parachute, he noticed "My right leg was no longer with me... the leather belt which attached it to my body had broken under the strain, and the leg, the Spitfire, and I had all parted company." He was knocked unconscious on landing and woke to find two German soldiers removing his parachute harness. Bader was taken to hospital in St Omer. His missing right leg was recovered from the wrecked Spitfire, and as soon as it had been repaired, he made his first attempt to escape. A rope made of bed sheets enabled him to climb down from a window, but he was soon recaptured and sent to Oflag VIB at Warburg. By that time the RAF had dropped a replacement leg by parachute, and Bader had determined to be "a plain, bloody nuisance to the Germans". After three months in Stalag Luft III, Bader was moved to Stalag Luft VIIIB at Lamsdorf, from which he made another attempt to escape. He and four others joined a working party outside the camp, intending to make their way towards the Polish border. 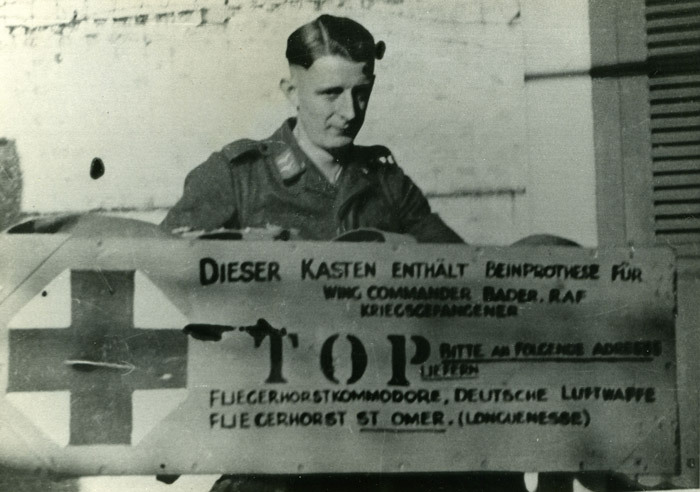 The alarm was raised when a Luftwaffe officer called at Lamsdorf to visit Bader and he was found to be missing; he was arrested and returned to Lamsdorf. 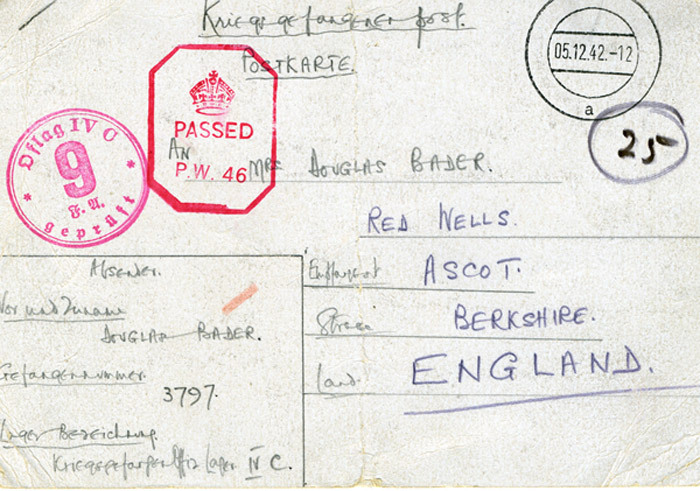 A few days later Bader was transferred to Colditz Castle - Oflag IVC. With typical boldness, he told the Germans that he expected "to travel first class and be accompanied by a batman and an officer of equal rank." 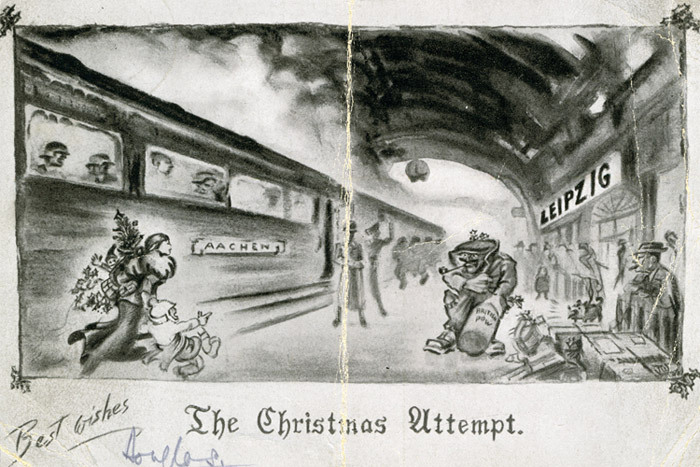 Colditz was thought to be escape-proof, and Bader remained there - making life difficult for his captors - until the camp was liberated on 15 April 1945. Teleprinter message relating to the parachute dropping of a replacement artificial leg over St. Omer, 19 August 1941. 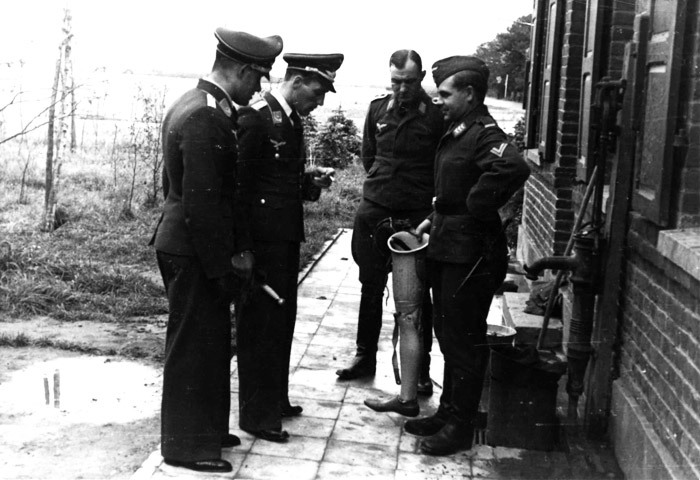 The Germans had offered to guarantee safe passage to an aircraft carrying a spare leg. The offer - which would have given the Germans welcome publicity - was turned down, and the leg was dropped by a Blenheim taking part in a bombing raid.